As more people become aware of the different kinds of chemicals in the items they use every day, they start looking for natural options. For example, air fresheners often contain harsh chemicals and artificial scents. The artificial fragrance is especially troublesome for those that have sensitive skin or other sensitivities. Thankfully, there are safe, natural options available for everyone. By using an essential oil diffuser, you can eliminate all the harmful chemicals and freshen the air in your home naturally. The essential oils also have several great health properties that work especially well when you inhale it. In your search for the best essential oil diffuser, you should consider the InnoGear 2nd version ultrasonic diffuser. The InnoGear 2nd version ultrasonic diffuser does not look different than other ultrasonic diffusers. It has a wide base that narrows at the top, where it then spreads the water and essential oil vapor throughout the room. One difference though is how small and compact this diffuser is. It is about as tall as an iPhone 7 and not much wider, yet can still diffuse oil for hours on end. This makes it especially useful for those that want to move their diffuser from room to room as they go about their day. It currently has an Amazon rating of 4.3 stars, so most customers think the product performs well too. We will take a closer look so you can know what to expect. This InnoGear essential oil diffuser contains mostly plastic, and the bulk of it is polypropylene. This kind of plastic is lighter than most plastics, but it is also extremely sturdy. It has a high resistance to electricity, making it ideal for electronic devices like this diffuser. It even has a great chemical resistance, meaning that both acids and bases have a hard time wearing the material down. This means that using vinegar or alcohol to clean this diffuser will not harm the object in the process. With that said, you do not have to worry about the material of this diffuser breaking down or taking damage while you use it. You can expect to use it for a long time without any problems. We all know that plastic is not good for the environment, but single-use plastics are a big problem. Using a durable plastic for essential oil diffusers is not a problem because you can use it time and time again without harming the environment. Once you need to dispose of the diffuser, you can contact the manufacturer to see what you can and cannot recycle. You can also contact your local recycling facility to see if they have certain regulations. The InnoGear 2nd version aromatherapy diffuser offers both the benefits of an essential oil diffuser and a humidifier. If you live in a drier climate, this is the type of essential oil diffuser you need. With the humidifier aspect, you can relieve dry sinuses and dry skin. With the essential oils, you can also enjoy the benefits of aromatherapy. Many oils are antibacterial, antiviral, and antifungal, so they can also keep germs at bay while you relax. This specific diffuser has two modes of operation. One of them releases a stream of vapor for 30 seconds, shuts off for 30 seconds, and repeats the process until you turn it off. The other mode releases vapor continuously until you shut it off. You can choose whichever mode you prefer. The 30-second interval one may be best for smaller rooms, and the continuous one will quickly fill a larger room with the scent. You get to choose which mode you prefer. This InnoGear essential oil diffuser also has an automatic shut-off feature that turns the diffuser off when it runs out of water. This prevents the diffuser from burning out, which prolongs the life of the product in general. With the 30-second interval mode, the diffuser can run continuously for six to eight hours. With the continuous mode, it can run for three to four hours. However, it is important not to run your diffuser for too long. Most experts recommend turning off your diffuser after a half hour to prevent overexposing yourself to the essential oils. The InnoGear 2nd version ultrasonic diffuser, as previously stated, is not much bigger than an iPhone 7. This allows you to take the diffuser wherever you need to diffuse essential oils. 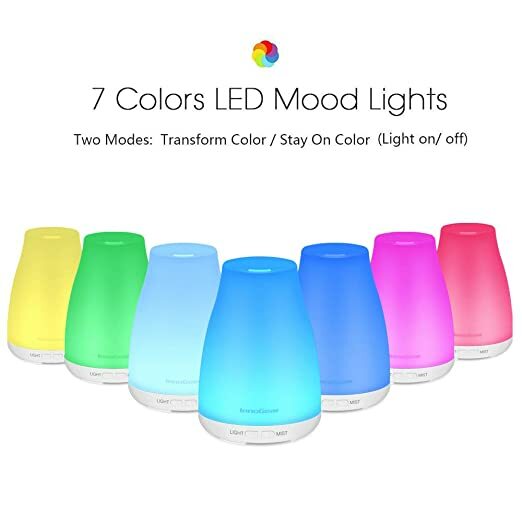 You can also purchase the diffuser in a variety of colored LED mood lights. This includes red, pink, yellow, green, light blue, dark blue, and white. You can turn the light on while you diffuse or turn it off, depending on your preference. You can also turn on just the light while you are not diffusing. This can act as a nightlight for any children that are afraid of the dark. This diffuser is available on the InnoGear website $15.99, or you can purchase it on Amazon for $13.59 with free shipping. Each package comes with the diffuser, power cable, and user manual. Be sure to always check the manual for proper use and cleaning. On the website, the company specifies to never fill the basin above the fill line. They also recommend using distilled water over tap water because it will prolong the life of the diffuser. InnoGear offer many other products other than essential oil diffusers, including solar LED lights and wireless communication products. They take pride in providing great products at a great price that are also efficient and eco-friendly. They also strive to provide the best customer service possible and meet their customers’ needs. In order to please their customers, they offer a 12-month warranty on all of their products and a 100 percent satisfaction guarantee. If you are ever dissatisfied, you can always send the product back. Most customers give this essential oil diffuser great reviews. They love how such a small product can spread the smell of their favorite oils throughout a room quickly and effectively. Most do not have any issues with the product breaking, but those who have experienced great customer service and received a new diffuser in the following days. This diffuser also comes at a great price that anyone who wants to try aromatherapy can afford. Most of the customers that left dissatisfied reviews are those that received a defective product. Unfortunately, this is more likely to happen when buying a cheaper product. It is also important to verify who you are buying the product from to make sure it is a credible source. Thankfully, with InnoGear’s 12-month warranty, you can return any defective diffusers and receive a new one in return. We definitely recommend the InnoGear 2nd version ultrasonic diffuser to those who want to try aromatherapy. This is a cheap way to get started, and the company will take it back if you do not like it. This diffuser is small but can fill a larger room easily, making it great for a variety of room sizes. If you want to invest in a more expensive diffuser, there are several others on the market that are worth your money. Be sure to check out our list of the best essential oil diffuser options for your home so you can determine which one is the best pick for you. Essential oil diffusers are a great way to experience aromatherapy in your home. They can give you a variety of benefits, depending on the essential oils you use. Here are some top questions that I found for people seriously considering buying the InnoGear 2nd Version Aromatherapy Essential Oil Diffuser. Can I turn off the mood light while diffusing essential oils? Yes, the light is completely optional while diffusing. You can also turn on the light when you are not diffusing. Is the plastic BPA-free? Polypropylene is BPA-free and is also a durable material. You can diffuse as much as you want and it will not harm the plastic. Just make sure you clean it properly on a regular basis.